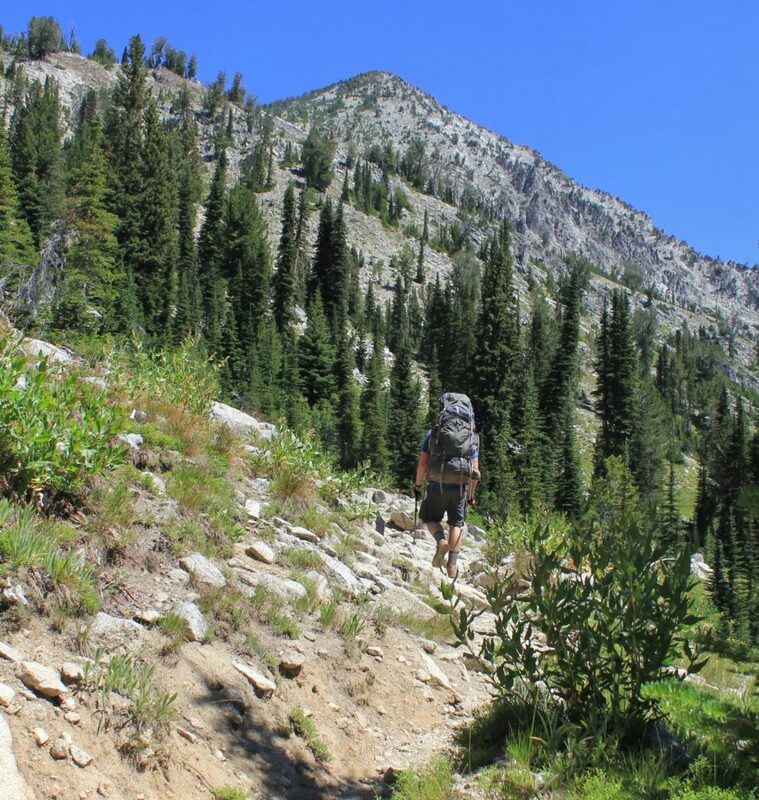 Normally, a backpack to a dammed lake would not rank high on our list of destinations. We seek out locations where we’re able to have a wilderness experience. 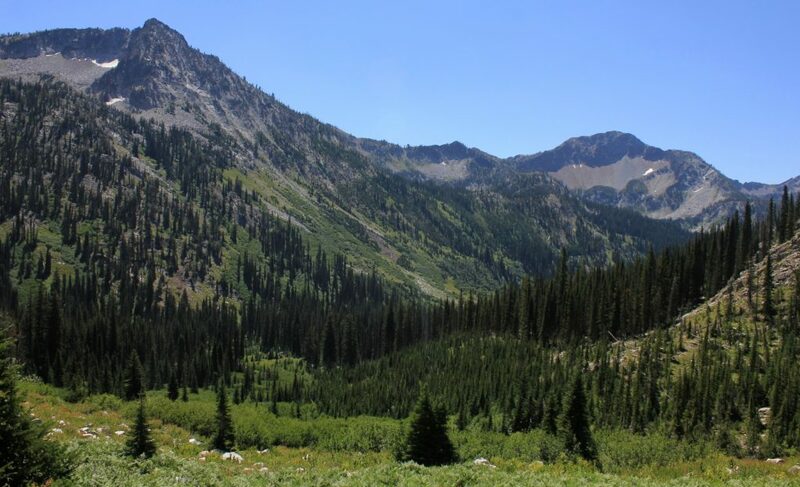 The Wilderness Act of 1964 defines wilderness as “an area where the earth and its community of life are untrammeled by man.” The very idea of wilderness is “in contrast with those areas where man and his own works dominate the landscape.” A dammed lake? That is not a wilderness experience! 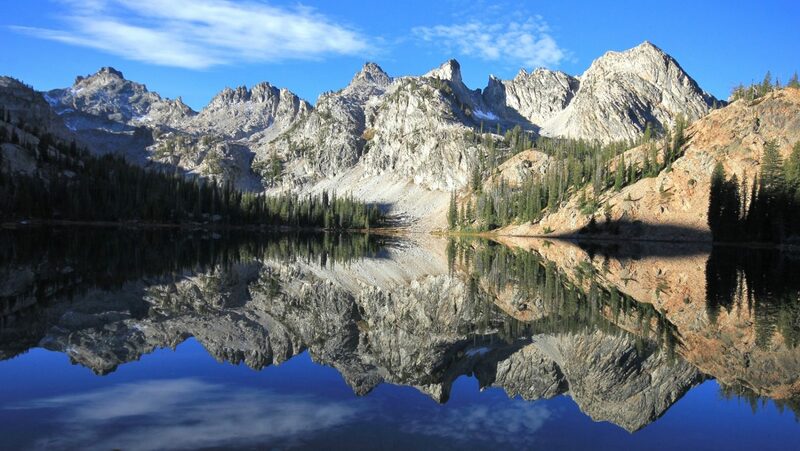 But when that lake is located in the Oregon’s Eagle Cap Wilderness, it deserves some consideration. 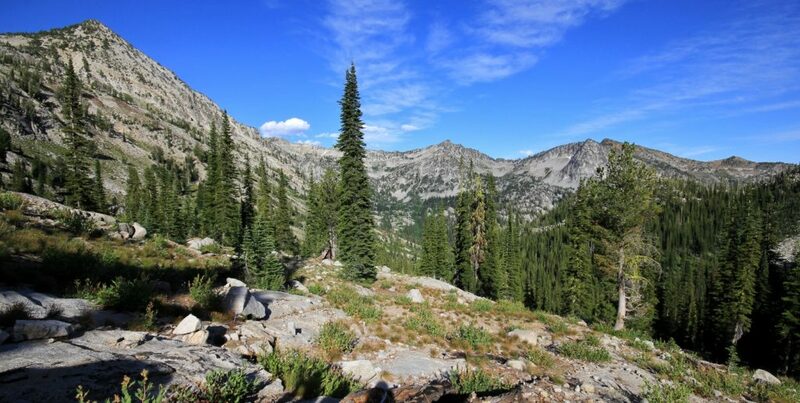 The Eagle Cap Wilderness of northeast Oregon is one of our favorite backpacking destinations. 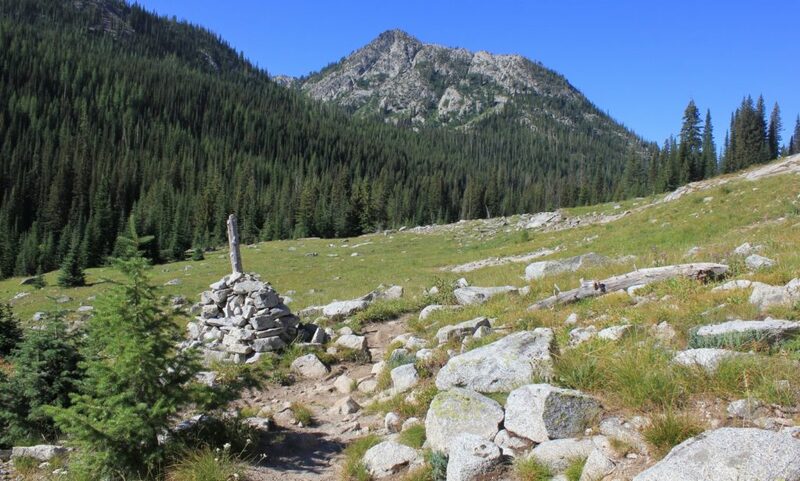 The closest trailheads are just a couple hours from our home in SE Washington, there are many high quality routes to choose from, and the alpine lakes found there are as beautiful as you’ll find anywhere. 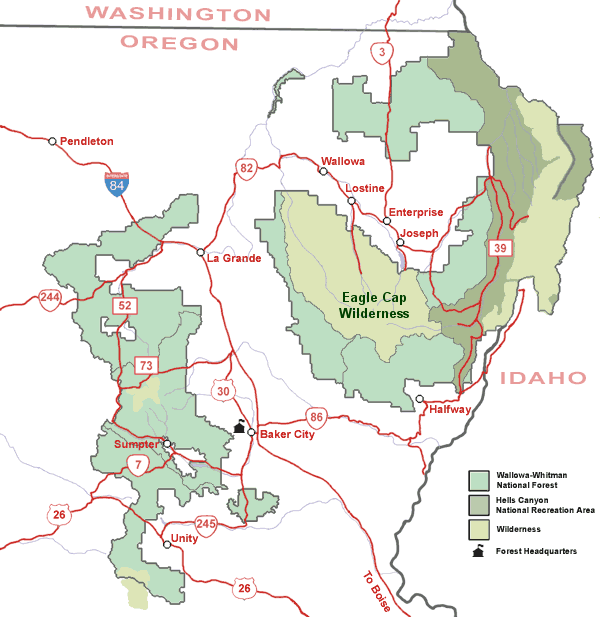 We’ve spent the last few years working our way through a bucket list of Eagle Cap routes. 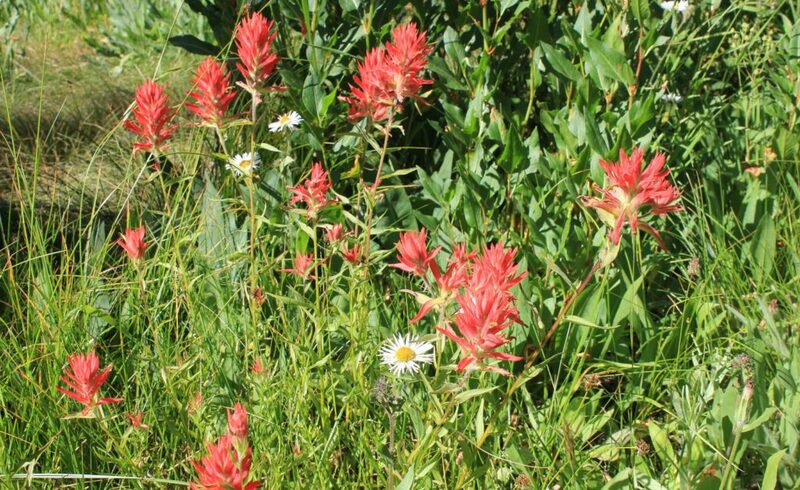 Most of our trips have been to the eastern side of the wilderness near the towns of Lostine and Joseph since that area is closest to our home and the most notorious lakes are located there. 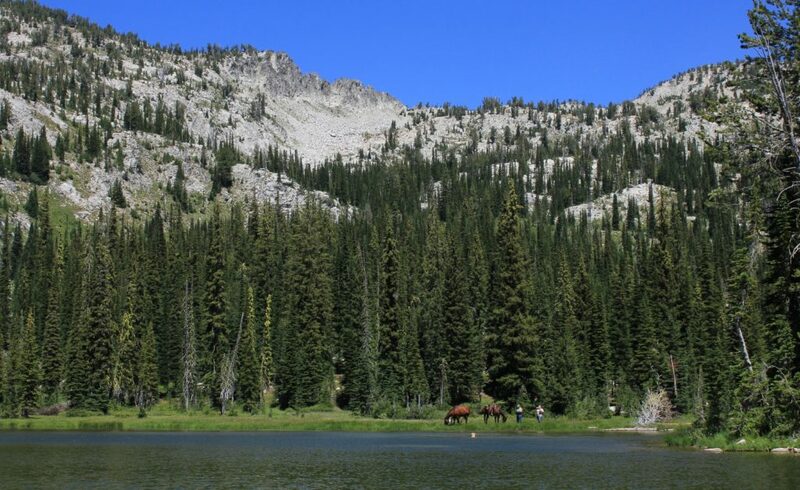 We had been hesitant to make the long drive and hike to the lakes on the western side since many are dammed and might not offer as much of a wilderness experience. 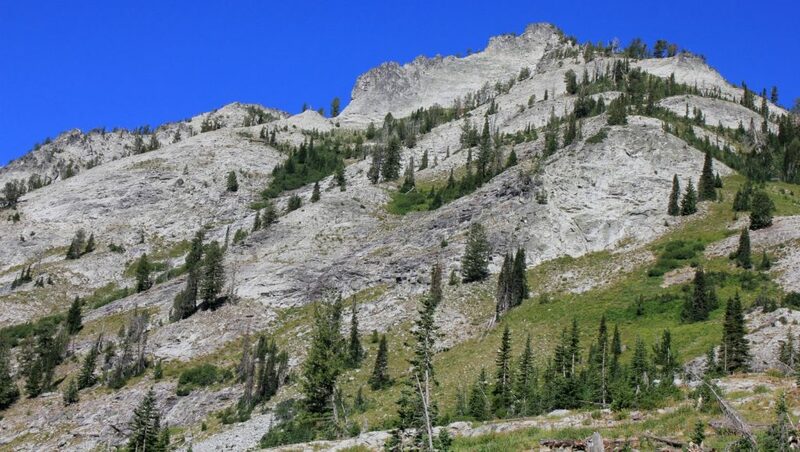 Over the years and after much investigation, I eventually came around to the notion that the Eagle Creek drainage on the western side of the wilderness would indeed be backpack worthy. 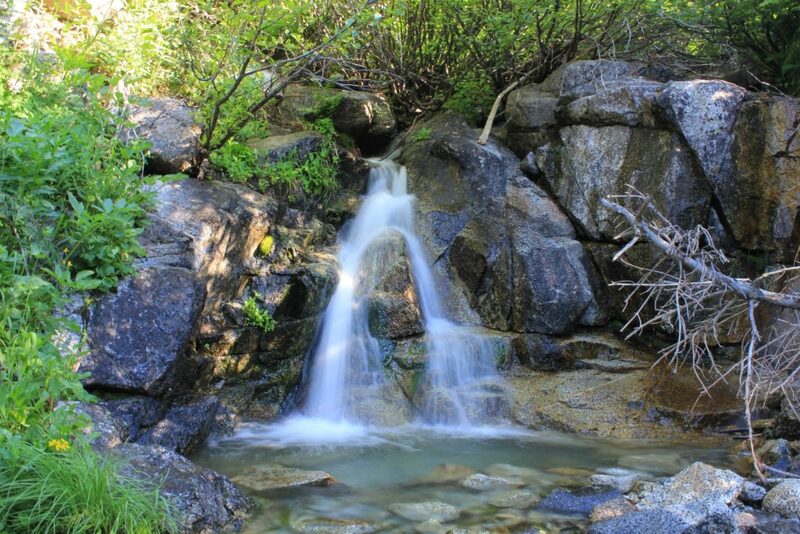 Eagle Creek has three branches with well-maintained trials leading to beautiful alpine lakes. In July of 2017 we made our first trip to the area—a quick overnight up East Eagle Trail to Hidden Lake. The scenery was stunning and the trip left me wanting to explore more of the area’s beauty. 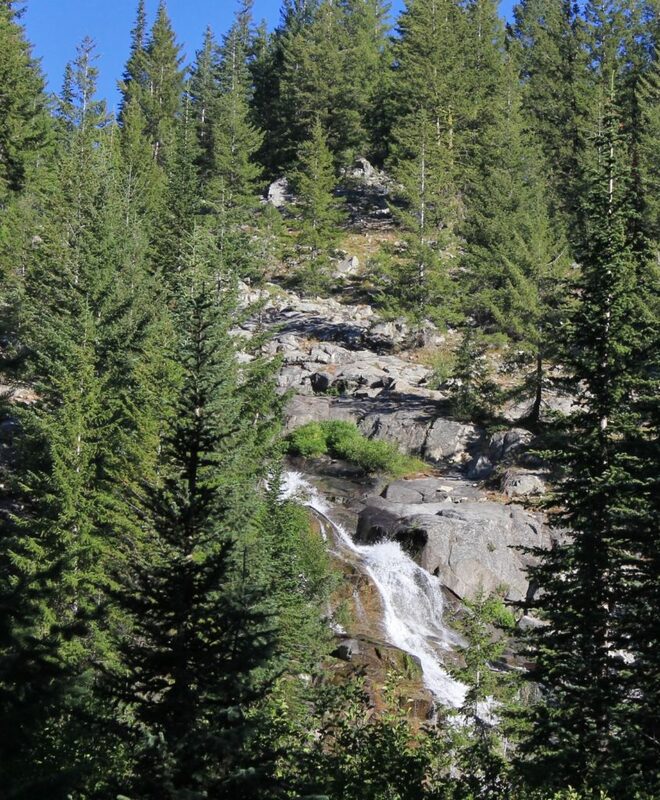 In July 2018, we took a four day weekend to explore another area of the Eagle Creek drainage. 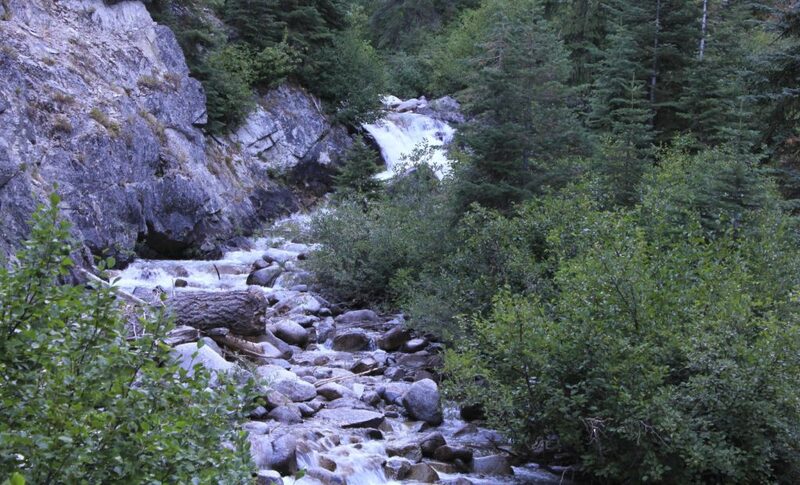 The question was, would we hike up West Eagle Creek or Main Eagle Creek? 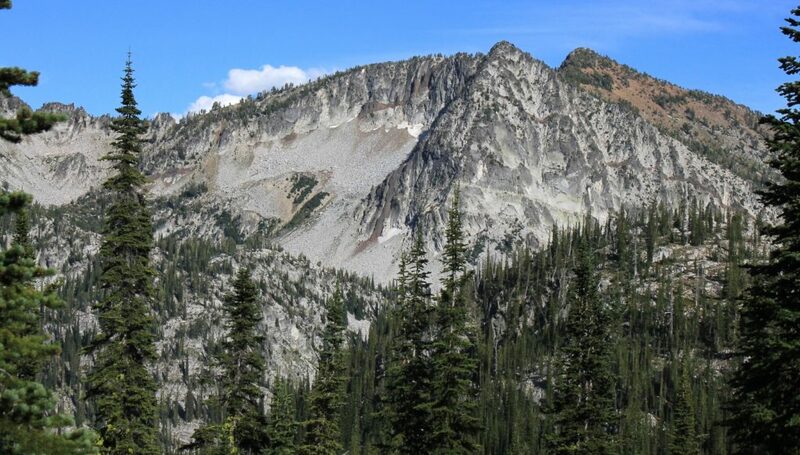 Both trails lead to alpine lakes beneath towering granite cliffs, but some of those lakes are dammed. It was time to answer the question, would those lakes be as stunning as the rest? After some calculations, Main Eagle looked to be the best option for a four day trip. Click here for Forest Service map and trail description. We left work early on a Wednesday afternoon and made the five hour drive to Boulder Park Campground in Wallowa Whitman National Forest southeast of La Grande, Oregon. We arrive just in time to throw up our tent in the last bit of daylight. It had been a long day, but we were just minutes from the trailhead which would allow for an early start to beat the late July heat. Thursday morning we were up at 4:00. With the help of a cup of coffee, I was quickly energized and had the nervous excitement that I always get before a backpack. We broke camp, made a few last minute adjustments to our gear, and made the short drive to the Main Eagle Trailhead (elevation 5,063’). There were just seven other cars at there, one of those a Forest Service truck. A month later, we’d count almost 100 cars at the Two Pan Trailhead on the more popular eastern side of the wilderness. We began hiking at 6:00 with a comfortable temperature of 50 degrees. 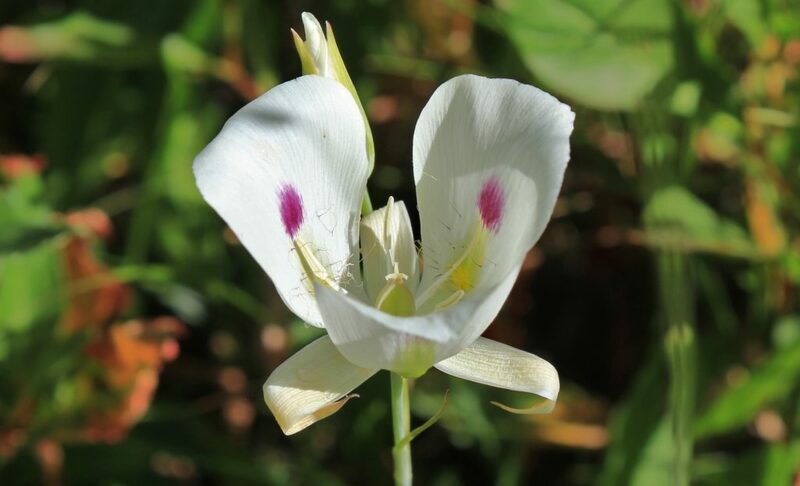 We started with a climb up and over a bolder field from an old slide and then dropped down into forest where we began a gradual and continuous climb. 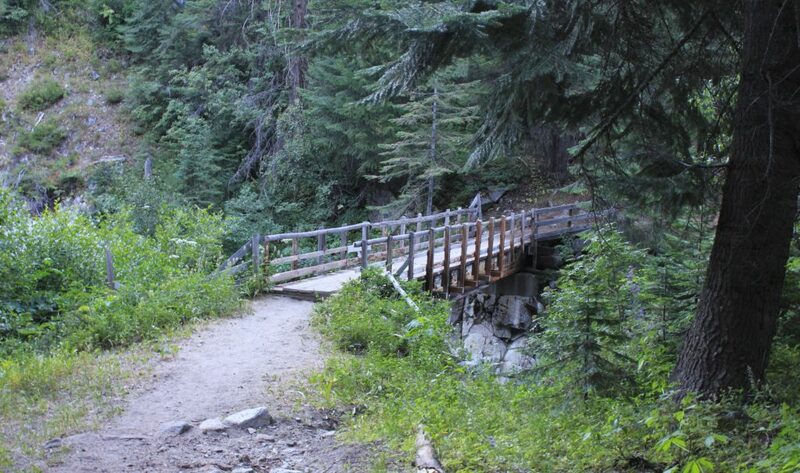 At 0.5 miles, we crossed Main Eagle Creek on a very nice footbridge. Just upstream was a nice little waterfall. We continued along the eastern side of Eagle enjoying the morning shade and comfortable temperatures. 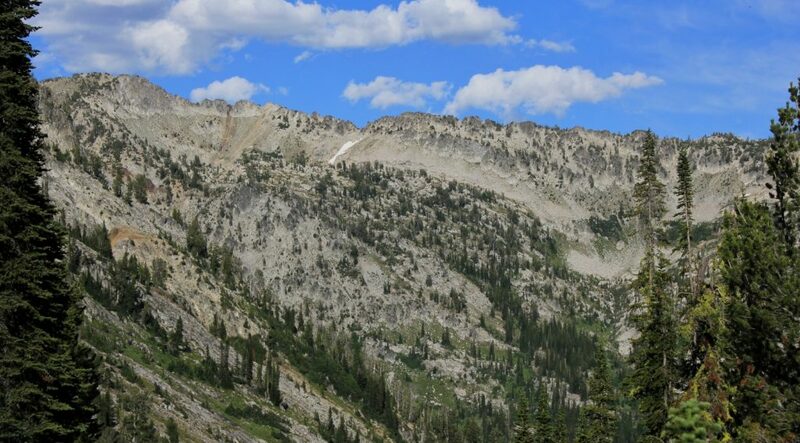 Impressive cliffs towered above us and we could see some nice looking Eagle Cap peaks ahead in the distance. 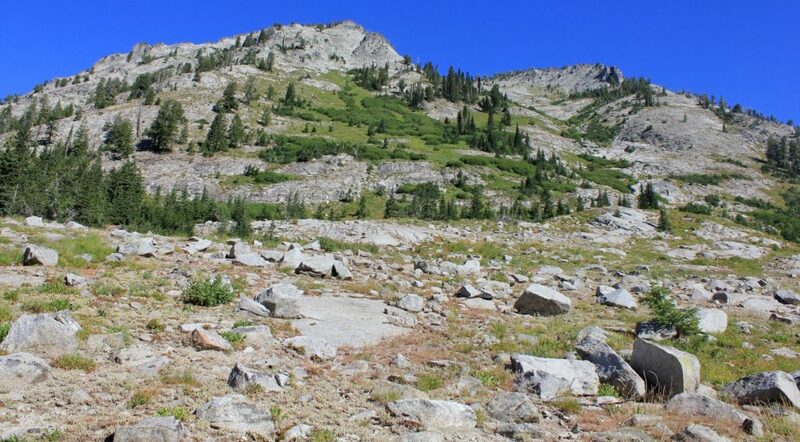 At 1.7 miles we reached the Eagle Cap Wilderness boundary. 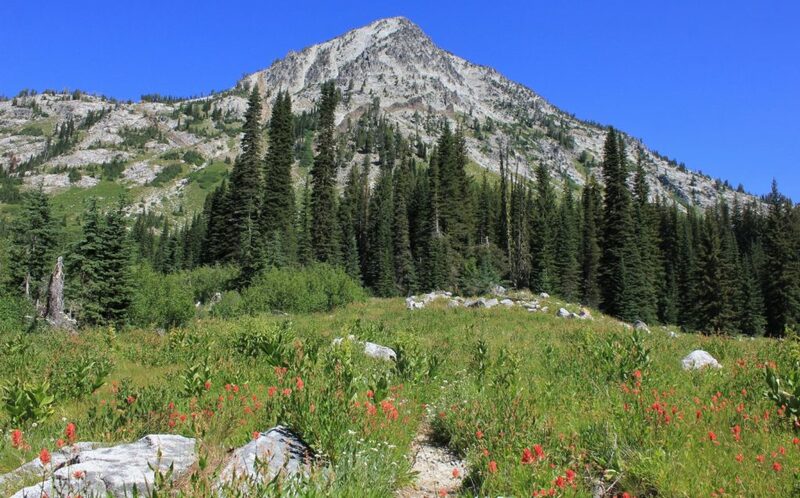 The next section of the trail was pretty overgrown with wildflowers in peak bloom. 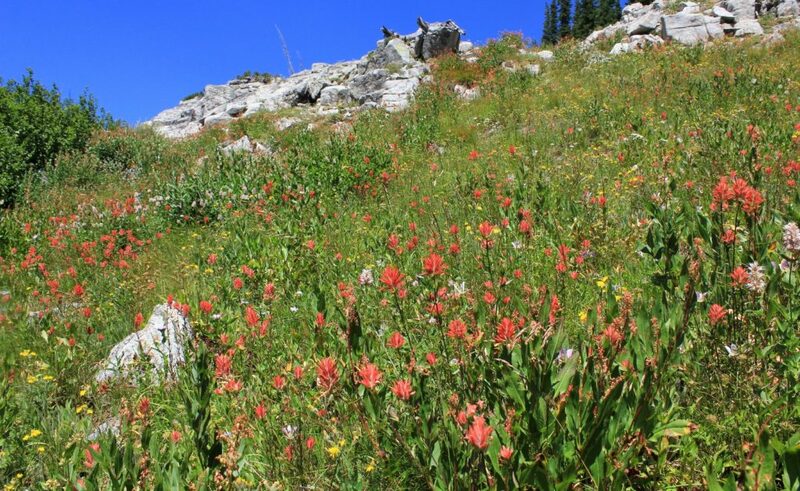 They were gorgeous, but covered the rocky trail which slowed our progress. There was also about half a mile stretch with stinging nettles mixed in. 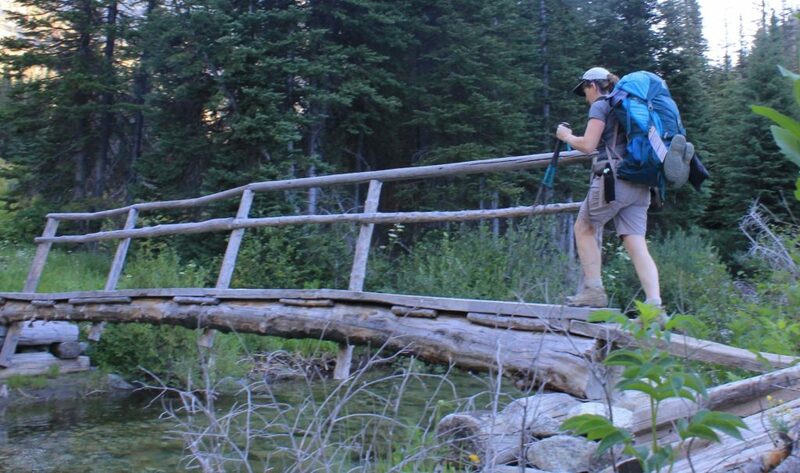 At 2.2 miles we crossed back to the west side of Eagle on a rickety bridge. Now we were in mixed sun and shade. Our views really started improving and soon we caught a glimpse of Copper Creek Falls to the left. A short distance after the falls, we came to a slightly confusing area where a water crossing and social trails made it difficult to locate the main trail. The GPS was helpful and I was able to see that we weren’t yet at the Bench Trail split. We continued to the left and soon came to the trail split at 2.7 miles. Bench Trial to the left was signed as unmaintained. I have heard it is very steep (one source described it as a bobsled shoot) and a fellow backpacker told us that it is unnavigable in many places. We continued on the obvious trail to the right. We continued for another 1.4 miles along gently ascending trail. We had a couple pretty stream crossings and improving views. We lucked out and had more shade in this stretch than I had anticipated. The hiking was relatively easy and comfortable. 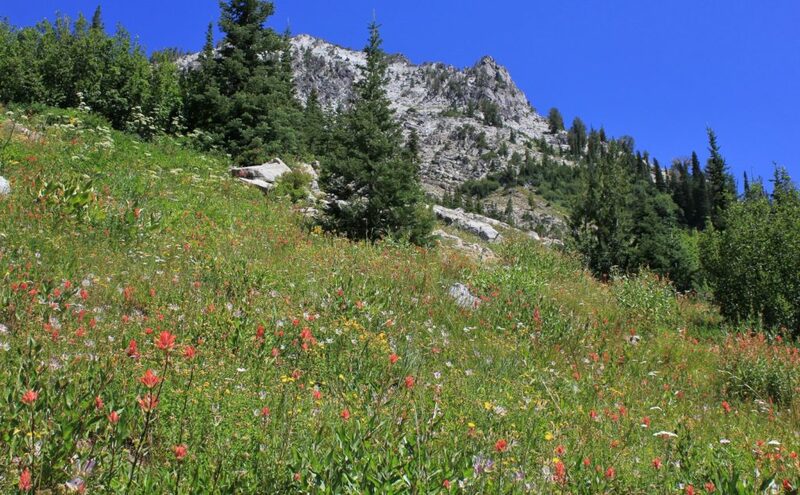 At just shy of 4.0 miles we came to the beginning of Eagle Creek Meadow at 6,160’ elevation. We could see Eagle Creek down to the right and big glacier carved boulders strewn about. At 4.0 miles we came to a large rock cairn with a post in the middle. There was no sign, but this was the major junction we were looking for. 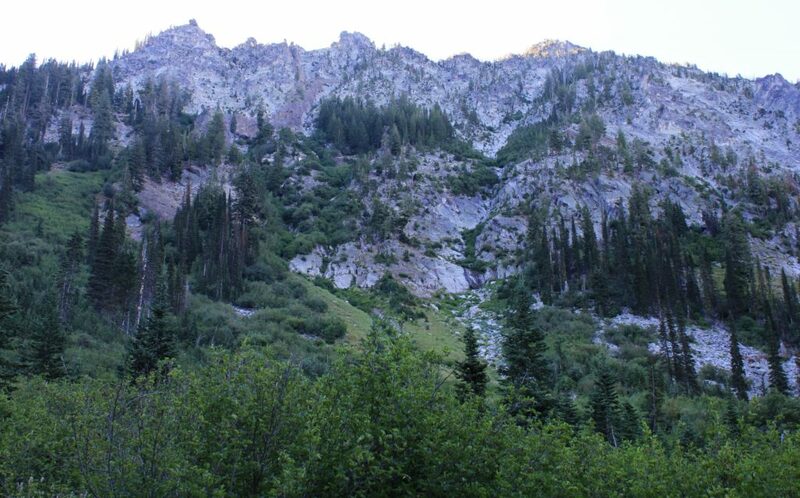 To the right continued to Bear and Lookingglass lakes. 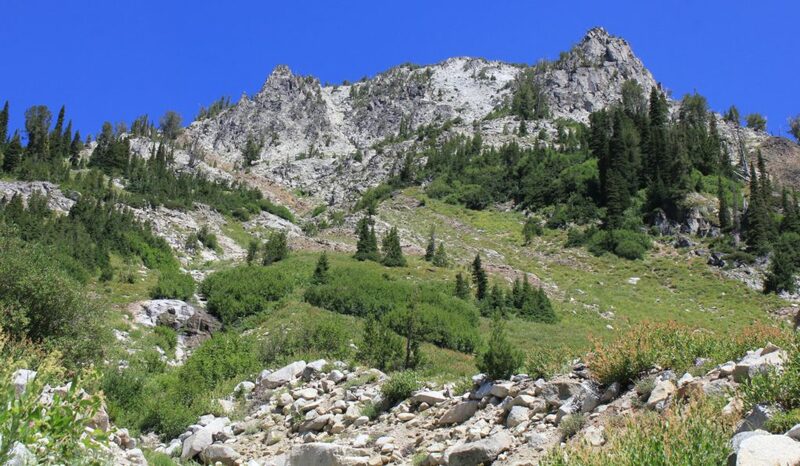 We continued straight ahead toward Cached and Eagle lakes. Over the next half mile or so, we saw a couple nice campsites to the right of the trail. These would be nice creek side sites if you wanted to stop for the night. We stopped at one that was down in dense trees. We enjoyed the cool shade while filtering some water and having a snack before our final few miles of climbing. Shortly after resuming our hike, we ran into our first hikers of the day- a father and daughter who were coming down out of Cached Lake. They reported having the lake to themselves the evening before. At a little over 5 miles from the TH, the trail steepened a bit and we left the shade as we ascended along a series of switchbacks. Views were really opening up and we could see back down the Main Eagle drainage where we had just come from. Soon I could hear voices behind us. Down the switchbacks, we could see two women and three horses approaching. We found a good spot to get off the trail and ended up chatting for quite a while when they passed. 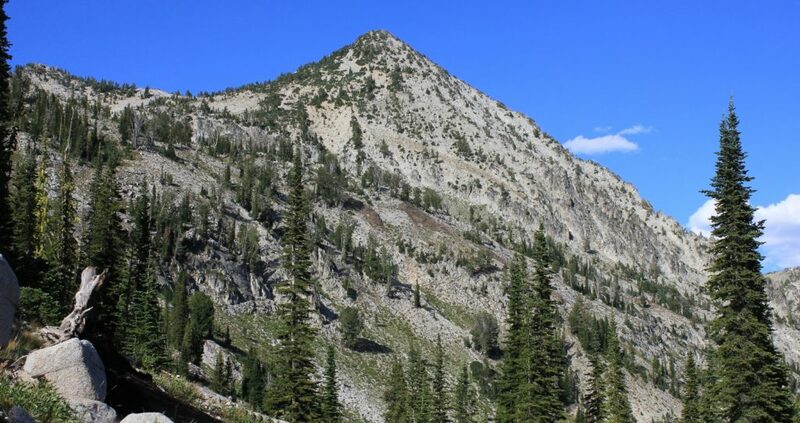 They were from the Baker City area, but had never been up Main Eagle. 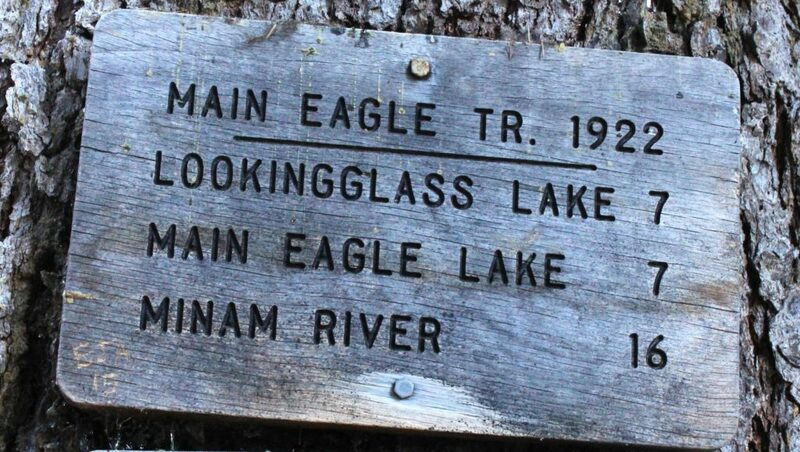 When one woman made reference to Lookingglass Lake I was confused and asked, “you know that the trail to Lookingglass split off a couple miles ago, right?” This came as a complete shock. I asked if they hadn’t seen the big rock cairn shortly after entering the meadows (it would have been pretty difficult to miss). In fact, they had not seen the cairn. It seems one of the horses left the trail and headed straight for the creek as soon as it saw the water. They took the news with good spirits and said they’d return the following day to do Lookingglass. At almost 6 miles from the TH we came to the split (elevation 7,100’) for Eagle Lake to the right. The trail looked faint, but I’ve heard that its good trail. 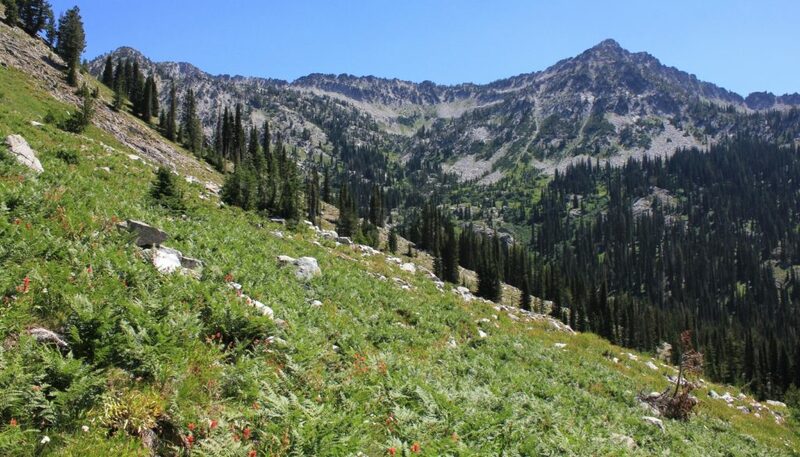 We continued toward Cached with fantastic views and abundant wildflowers. 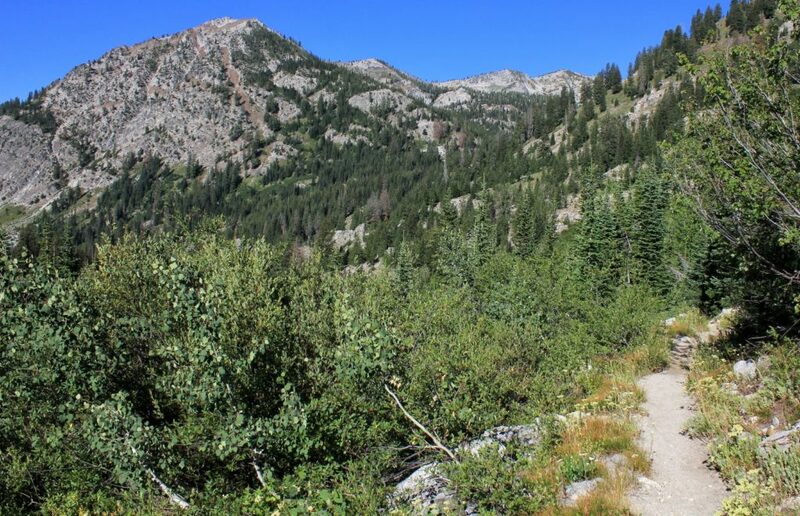 The final 1.3 miles to Cached Lake were the hardest of the trail. The hiking really wasn’t that hard, but we had already climbed 2,200’ over six miles and now we were climbing in full sun and afternoon temperatures. 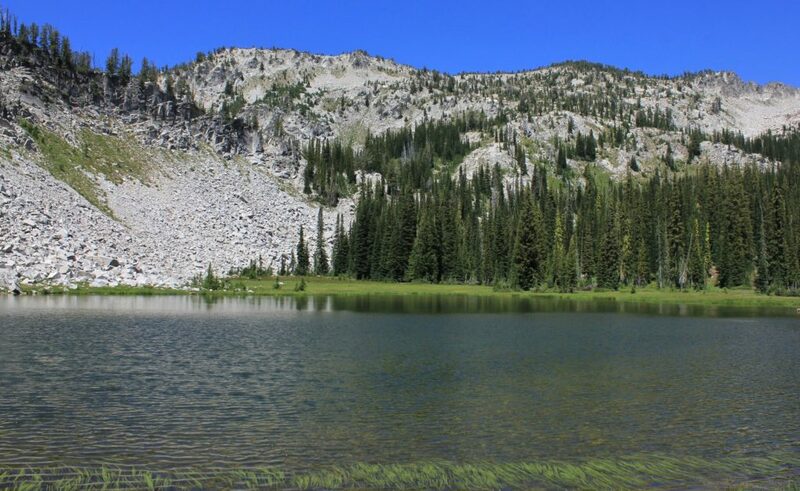 We topped out at lovely Cached Lake, elevation 7,311’ a little before 1:00. 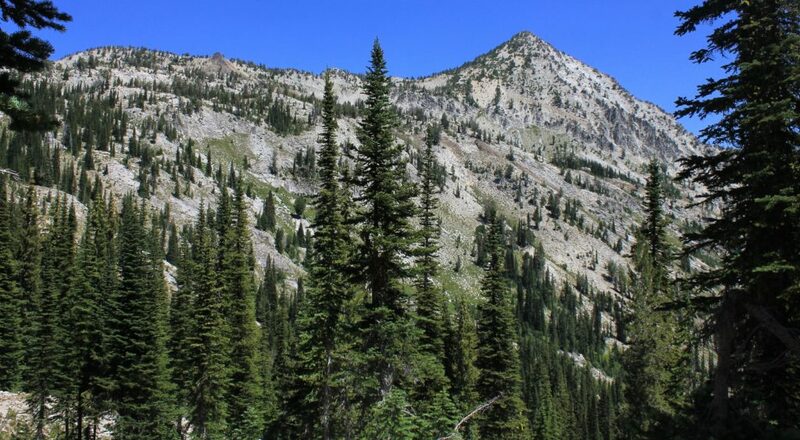 It had been a 7.3 mile hike with 2,250’ elevation gain. It appeared that the only other people at the lake were the two women on horseback and they left after about half an hour. Arriving at the lake, we crossed the outlet stream and searched around the left side for a campsite but didn’t find anything good. We retraced our steps and found a nice spot where the trail reached that lake. We went to work setting up camp. 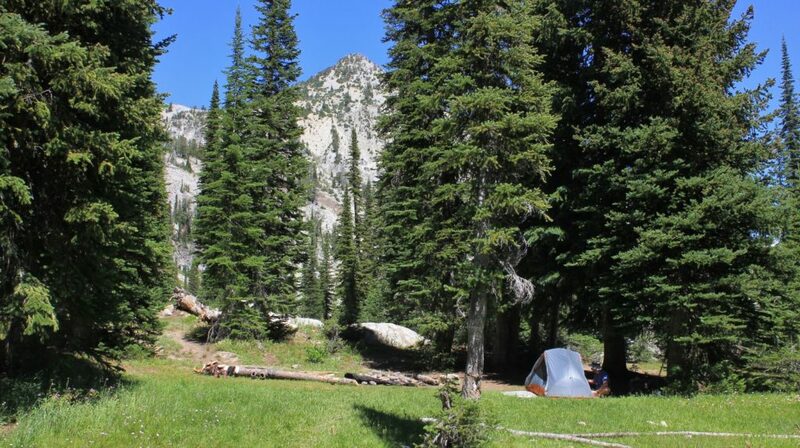 We had a nice grassy area for our tent with a lovely view of the lake. As anticipated, the lake was small but more scenic than I had anticipated from photos I’d seen. Like others, my photos fail to capture the beauty of the lake. We enjoyed a quiet afternoon around the lake. Jason took a nap while I started a new book. Later we did a little exploring and found some great views from behind camp. 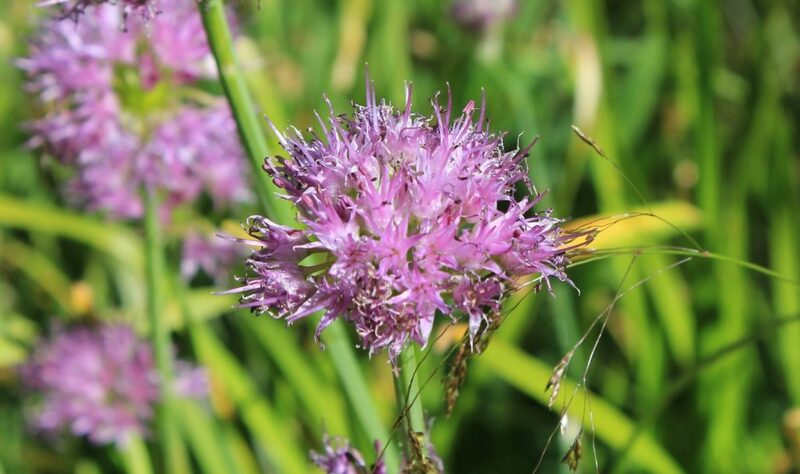 It was the perfect summer afternoon with sunny skies and temperatures in the mid-upper 70s. Later in the afternoon, I saw someone coming down the trail from behind camp. It turned out to be an older man, probably mid to late 70s. 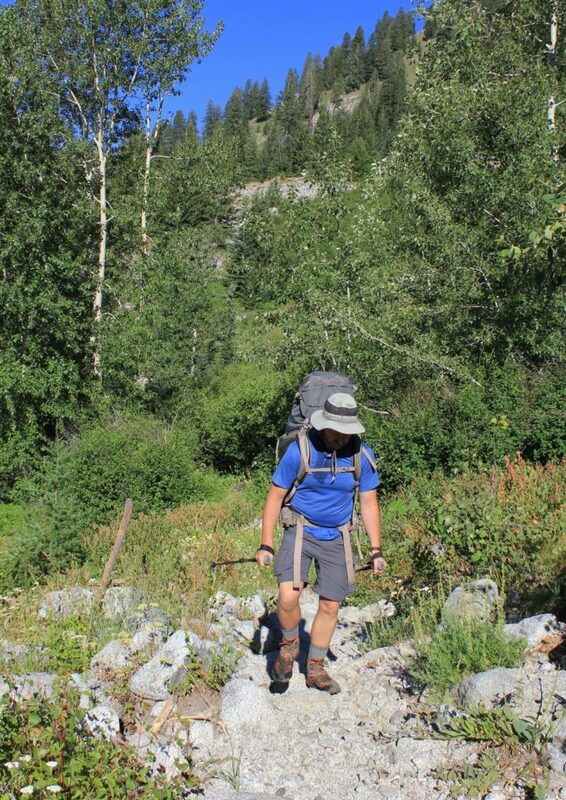 He’d been backpacking in the Eagle Cap for 50 years and had 30 some lakes he wanted to see this year. After some pleasant conversation, he made his way to the far side of the lake and we never saw him again. We only heard him one time later that day, a couple brief ax chops and that was it. He was the perfect neighbor and the only company we’d have at Cached Lake aside from the women on horseback. As usual, we were in bed early. 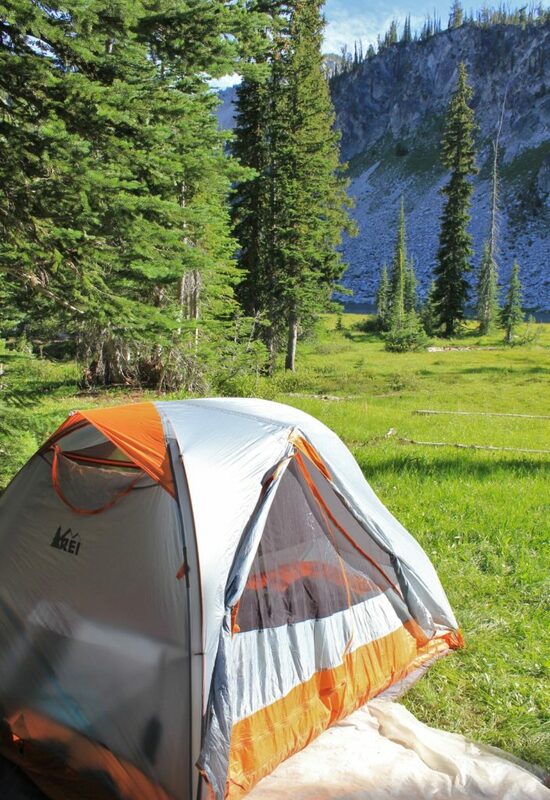 As we lay there reading, I heard something right outside our tent—it sounded like footsteps. I looked up to see a doe feeding just five feet from our tent. Appearing as though she was in a spotlight under the full moon, she grazed a circle around our tent multiple times that night. It wasn’t until the wee hours of morning that she left us. What a great ending to day one of our backpack. Directions to trailhead: from La Grande, Oregon, take I-84 exit 265 and travel Highway 203 for 14 miles to the small town of Union. Turn left and continue on Highway 203 for 21 miles to Medical Springs. At Medical Springs (which is more of a spot on the road instead of a town), turn east (left) on Eagle Creek Drive and begin following signs for Boulder Park. The paved road soon transitions to good gravel. At 1.6 miles, fork left onto single lane Big Creek Road 67. 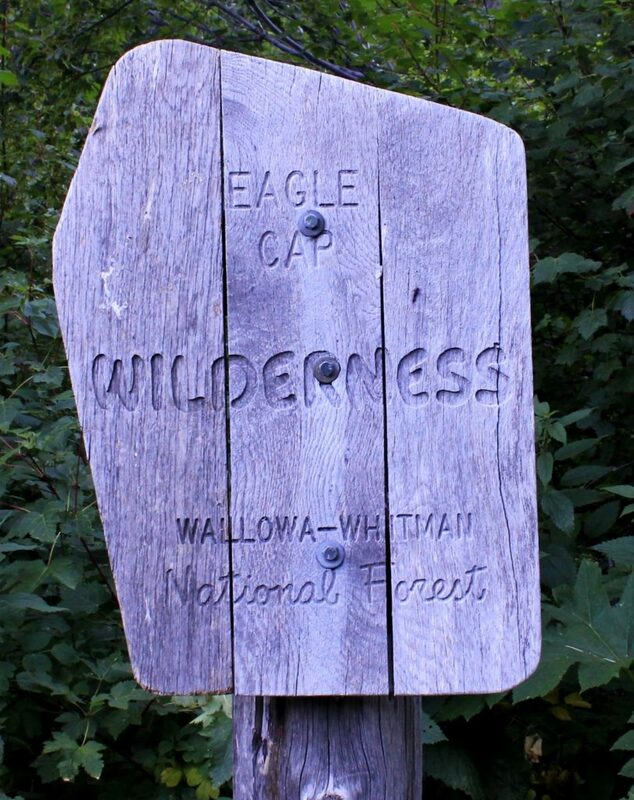 Travel 14.6 miles and turn left on Road 77 for just 0.8 miles then continue straight on Road 7755 for 3.7 miles to the end of the road at the Main Eagle Trailhead. 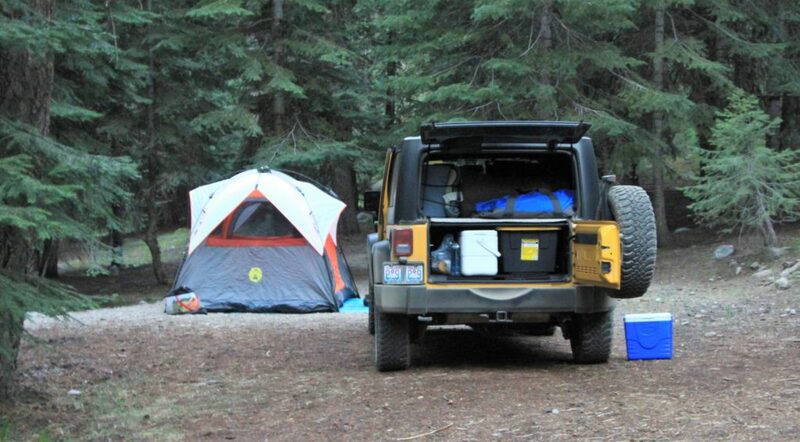 We spent the night at the Boulder Park Campground which was just shy of the trailhead. 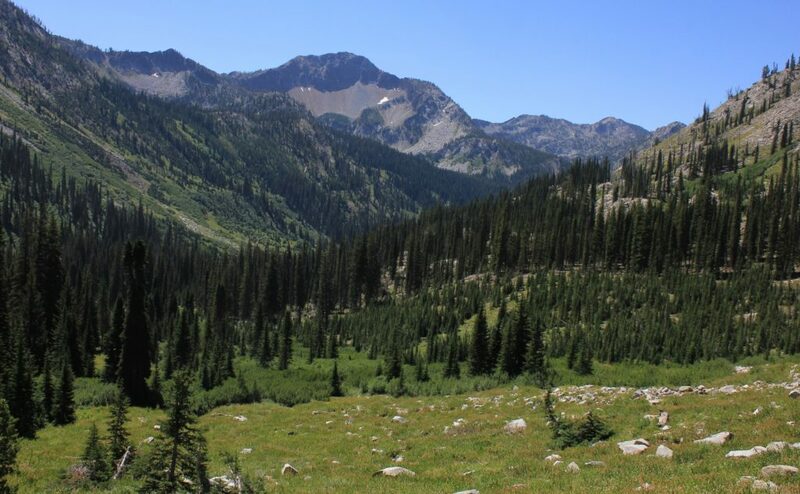 This is a small, but free Forest Service site.